Give your most important kitchen tools, yes knives, a reward! Have you ever experienced pulling out several knives to find a just perfect knife for your precise sushi roll? Have you ever noticed that little crumbs got into the slot of chunky blocks and made your precious knife to be rusted? I always wonder what might be living inside of those dark and mysterious slots. You may never know what's in there, it may always be waiting for your knife to come in, hop on it and spread germs and bacterias all over your food. It's time to change how you store your knives for the better sanitary system and give them some pride as the most important kitchen helper! You don't need to stack unnecessary clutters into those tiny dark slots which does not fit properly. Choose your most favorite, most frequently used culinary pieces and unlock the master chef in you! Our Knife holder organizes your knives and keeps knives from getting dull by revolutionized storing and displaying your knives elegantly and securely. This knife block keeps knives close at hand ensuring unparalleled ease of use. Made of premium bamboo with natural grain. Constructed out of durable bamboo with strong, permanent, and hidden magnets. Hand wash only and polish regularly with food-grade mineral oil to keep the bamboo's natural beauty and smooth finish. Dimensions: Approx. 10.25" x 8.75" x 4.0"
PATENT PENDING, VAESATILE & MULTI PURPOSE: Not only great for storing knifes, kitchen sears, cutlery widgets, or metal objects that lay around home and Kitchen, but also used as a sturdy stand, holder for iPad, iPad Mini, iPad Pro, tablet, Nintendo Switch, E-readers, Google Nexus 7/9/10 and Most Other Tablets. And even can be used as a Recipe holder and Cook Book Stand. SANITARY & EFFICIENT: With no unreachable and cleanable slots where bacteria can grow and thin slots where sometimes can be challenging and time wasting to slide in, our Magnetic Block is the perfect solution for health conscious and busy moms and chefs. Also, not limited to different sized slots, you have the freedom to choose any size of blades you wish and multiples of same if desired. 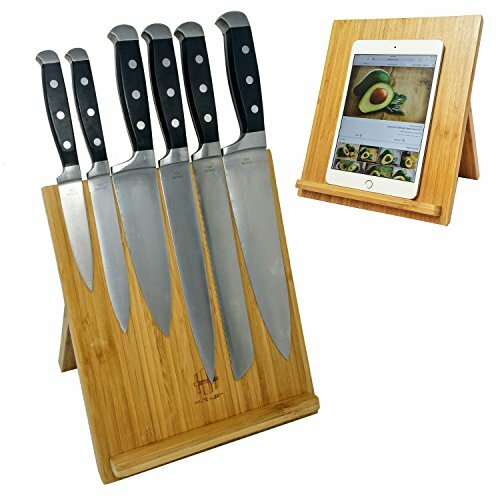 MODERN DISPLAY OF CULINARY GADGET WITH STRONG MAGNET: Constructed out of durable bamboo with strong magnets, the block displays your knives securely and stylishly. Simply place the flat side of the knife near or on the block to attach. When ready to use, grip the handle of the knife and gently jerk or twist to detach. CUSTOMER PRIORITY & DEDICATION: Haute Alert is dedicated to providing quality kitchenware made only from high-quality materials. We are proud to stand behind our Bamboo Magnetic Knife Block. If our product does not meet or exceed your expectations, we offer a 30-day money back guarantee backed by the Haute Alert Brand Guarantee, and our dedicated customer service team. If you have any questions about this product by Haute Alert, contact us by completing and submitting the form below. If you are looking for a specif part number, please include it with your message.